It has happened again, another workman has died at his workplace. It is a great shame. Let this not become just another statistic. Life is sacred. I can already see many people shrugging their shoulders and saying: “What can I do about it?” This is not right. 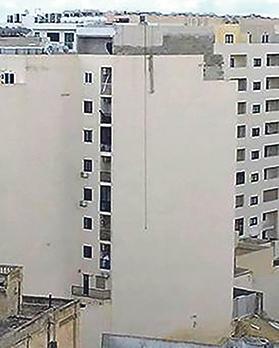 The site of the recent construction fatality in Sliema. We should all be more aware of this situation and urge our elected representatives to pass stricter legislation in the interest of safety at work. It seems that many construction workers are not provided with safety equipment and this must stop once and for all. There should be heavy fines for people neglecting such an important responsibility. Of course, the enforcement of health and safety laws is absolutely essential, without which laws are useless.